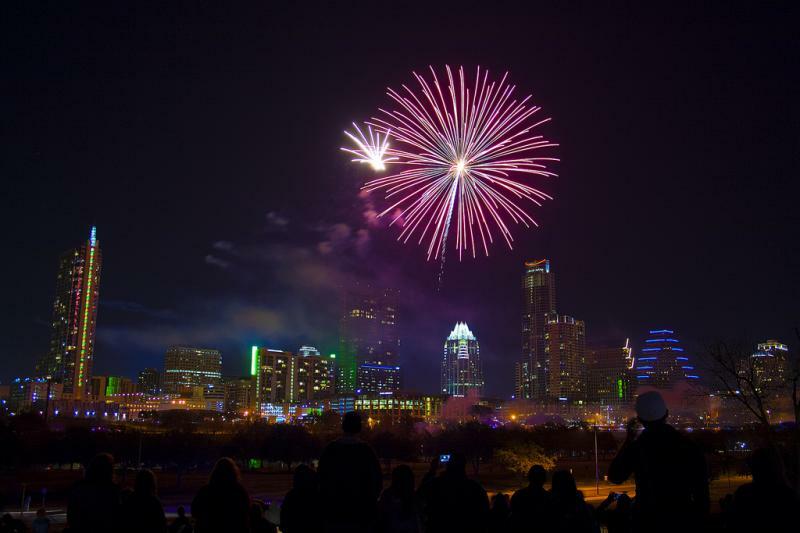 Celebrate 2016 in style at these incredible, all-inclusive New Year's Eve events in Austin, Texas! Austin's Hottest All Inclusive NYE Party! Reservations Are Limited And Tables Are Still Available! Drinks And Fun All Included! 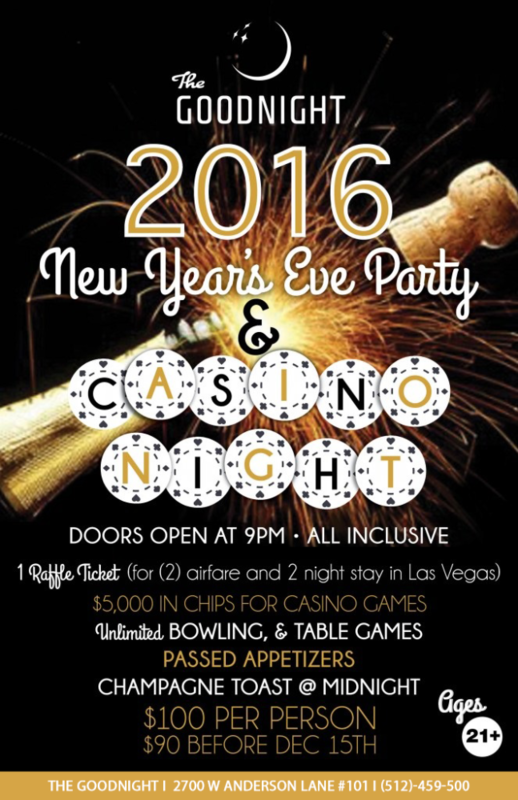 The Goodnight Presents 2016 All Inclusive NYE Party & Casino Night! Tickets Include: 1 Raffle Ticket For Airfare And A 2 Night Stay In Las Vegas For 2! 5,000 In Chips For Casino Games! 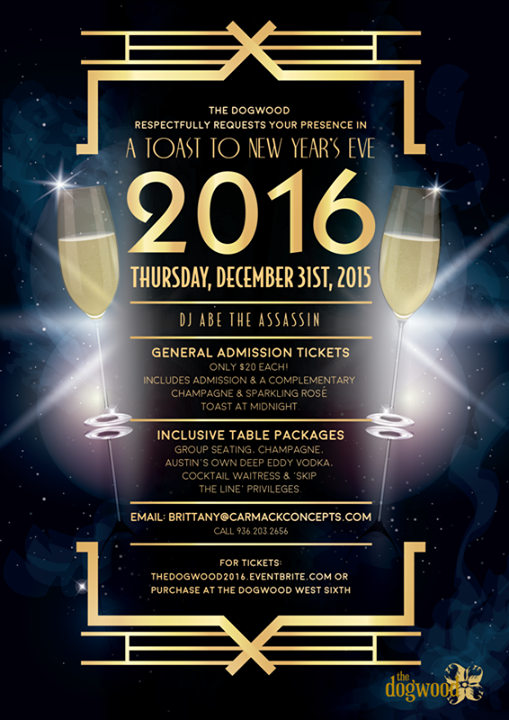 The Dogwood West Sixth respectfully requests your presence in: A Toast to New Year's Eve 2016! Doors open at 6:00pm, Thursday, December 31st, 2015. General Admission Tickets: Only $20 each! Includes admission and a complimentary champagne & sparkling rose toast at midnight. Inclusive Table Packages: Group seating, champagne, Austin's own Deep Eddy Vodka, cocktail waitress & 'skip the line' privileges. (Includes gratuity). Mark your calendars! 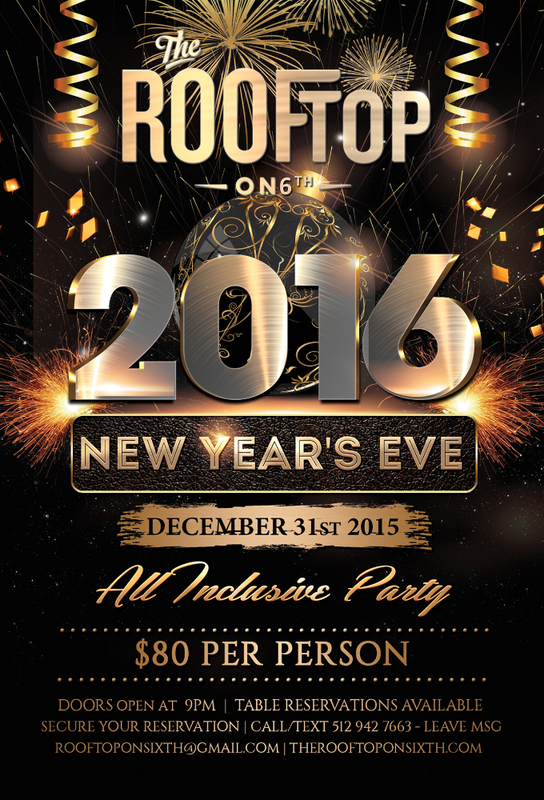 New Year's Eve 2015 - 3 parties under one roof - Balloons drops on every floor - Live music by SUEDE TICKETS. Dance 'Till You Drop Ring in the Mediterranean New Year‘s Eve Party 2016 in an international atmosphere and crowd. Three course dinner, midnight champagne toast, belly dancing show, Bollywood show, Flamenco show, a professional photographer and more!